>> See the award winners designed by Haley Marketing. Did You Miss Our Last Webinar, Online Staffing: How Will Your Business Play? Learn how online staffing is changing our industry and see some of the tools staffing firms are using. so you didn't have to! >> Takeaways from Staffing World. 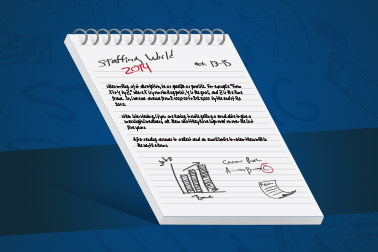 Want our full Staffing World recap? 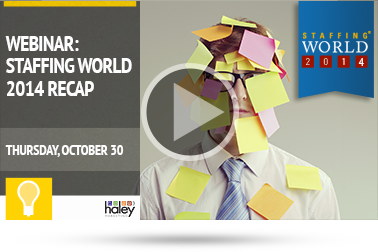 Sign up for this week's Lunch with Haley webinar. >> Click here to reserve your seat. And you know what that means...2015 is right around the corner! Want to discuss your marketing plans for the new year? Let's schedule a call. Click here or call us at 1.888.696.2900, and we'll be happy to help you with your plans. As for your holiday shopping? Well, that's another story!